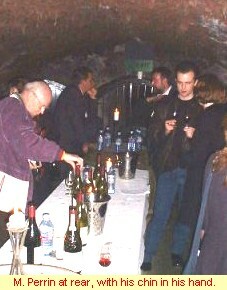 François Perrin, the current generation of the dynasty in charge of Château de Beaucastel and several other Rhône wines was in Edinburgh for a tasting organised by Raeburn Fine Wines and held in their atmospheric old cellars. On show was a range of wines, from the mass-production “La Vieille Ferme” for which Perrin is négociant, to several vintages of Beaucastel itself. M. Perrin spoke about his wines, explaining that for 30 years they have followed a strictly organic farming régime (“we use as a fertiliser half sheep’s manures and half marc de raisin“) and how the average age of vines for Beaucastel is around 60 years. The wines are around 30% Grenache, 30% Mourvèdre, 10% Syrah, then proportions of all 10 of the other grapes permitted in Châteauneuf-du-Pape. He is a great believer in the terroir of his wines: that only his particular vineyard sites can make these wines what they are. I took the opportunity to raise the subject of Brettanomyces with M. Perrin. “Brett” is a wild yeast that if accidentally included as part of the wine-making process imparts a distinctive “animal” smell to a wine that some people consider a flaw, and avery unpleasant one. Others (including myself) find that in a great Rhône or Burgundy wines this “gaminess” – wherever it comes from – is essential part of the wine’s character. Beaucastel is often cited as one of the most “bretty” wines. M. Perrin insisted that there is no detectable level of Brett in his wines. He said Beaucastel had carried out extensive laboratoryanalyis which proved this. He stated that the distinctive “animal” aromas which develop in his maturingwines were simply down to the nature of his Mourvèdre grapes which makes up a high percentage of the blend. He explained that the Mourvèdrehas a uniquely reductive character: that is, it does not absorb oxygen readily. At first that and other primary fruits are most evident in Beaucastel along with tannin. Aftersay 6-10 years the animal character of the Mourvèdre dominates as other components of the wine havebegun to meld, but the Mourvèdre stubbornly resists oxidisation and brutally imparts its pungent,manure-like aromas and flavours. With another 5 years or so the wine will finally gain balance and thecomponents – including the Mourvèdre – are resolved into a complex melange that is for the first time, inharmony. High, confected, pear-drop nose. Rather thin on the palate and very short with modest pear and apple fruit. Subdued confectionery nose with waxy notes. Again a little bit thin and short, but more richness and roundness on the palate of white fruits, though a very acidic finish. Buttery overtones to pear and apple fruit. Some rounder, peach and pear flavours with a little spicy note. Quite well balanced, though still high acidity and very much a wine that needs food. Lightly toasty nose, buttery with apricot fruit. This is quite luscious on the palate, creamy with peach-kernel and almond notes. Though there is a ripe, full, fruity character (again peach and apricot flavours) there is also a streak of bitter acidity that suggests this needs a few years. Very good. Sweet, slightly baked cherry-jam aromas. Creamy raspberry fruit over dry tannins and a little liquorice bitterness in the finish. Jammy and simple but quite good. More subdued, less jammy nose. Slightly herbaceous edge to cherry fruit. A little note of gaminess and big, dry tannins. Given a year or so this will be quite a nice wine. Nose of leather, plums, berries, spice and cream. A thick and creamy mouthful of ripe raspberry and cherry fruit, sweet vanilla and chocolate. Very silky and pure. Firm tannins, but a core of solid fruit. Very good. Nose of intense, pure, sweet, raspberry fruit with an undertone of gaminess. Very ripe and sweet raspberry and blackberry fruit on the palate. Ripe and pure. Firm, hard tannins really grip at present, but there is good length. Very promising. Really attractive nose with raspberry, chocolate and a leathery quality. Very dense and chewy on the palate, rich and ripe with grippy tannins and a really savoury character. There is plenty of cherry and berry fruit, but it is a little awkward at present. Having tasted this recently, I’m convinced it is very good indeed but will need time – maybe 5 – 8 years. More maturity here. Fine, complex aromas of game, leather, spice and black cherry fruit. Really starting to show complexity on the palate too, though firmly tannic and with decent acidity. Lush and full, it continues with chewy, dark flavours and considerable length. The character is brooding and spicy, with vegetal notes over black fruit. Lovely stuff. Again a wine which I’ve tasted before and found just excellent if you can take a certain amount of “gaminess” in your wine. Starting to drink, but needs 5 years. Very fine indeed. Gorgeous nose, wonderfully pungent with a bouquet of charcoal, game, sweet coffee and chocolate, farmyard, undergrowth and flashes of brilliant fruit. The palate is juicy and savoury with a lovely balance of gamy, meaty components, sweet fruit and still quite pronounced tannins and acidity. There is a great chocolaty depth and body to this wine and a fine, long finish where the purity of fruit pushes through. Excellent, though maybe one notch down from the wonderful ’89 which I tasted recently.